According to The American Heart Association, a 50% survival rate is achievable for a witnessed sudden cardiac arrest when the key principles of the BLS "Chain of Survival" are performed in an effective and timely manner (Berg et al, 2010). However, both in-hospital and out-of-hospital survival rates range from 5-50% which demonstrate opportunities for improvement in many settings. 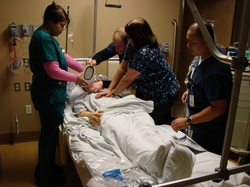 As a way to improve in-hospital and out-of-hospital survival rates, the First 5 Minutes--In situ Mock Codes educational process was implemented to provide a realistic and interactive learning arena for participants to practice the key principles of the BLS "Chain of Survival" before the arrival of the Code Team. The First 5 Minutes--In situ Mock Codes occurs as an unannounced on-site mock code in the participant's working environment with the use of a high-fidelity mannequin. The in situ mock code provides an opportunity for participants to utilize the organization's emergency activation process, access unit equipment, apply defibrillator/AED pads, use their defibrillator, and practice effective BLS skills. Every mock code is followed by a 2-5 minute debriefing session to discuss what went well, identify learning gaps, discuss best practice, share updated 2010 American Heart Association BLS changes, and answer participant questions. An assessment tool is used to collect data that identifies learning gaps, and tracks key critical actions to analyze effectiveness of the course. Hands on and reviewing keeps up knowledge and skills. Simulation and actual "doing it" is more useful than lecture. It makes it real. Interactive and sharing of information was helpful. It was helpful to get clarification on some clinical issues.